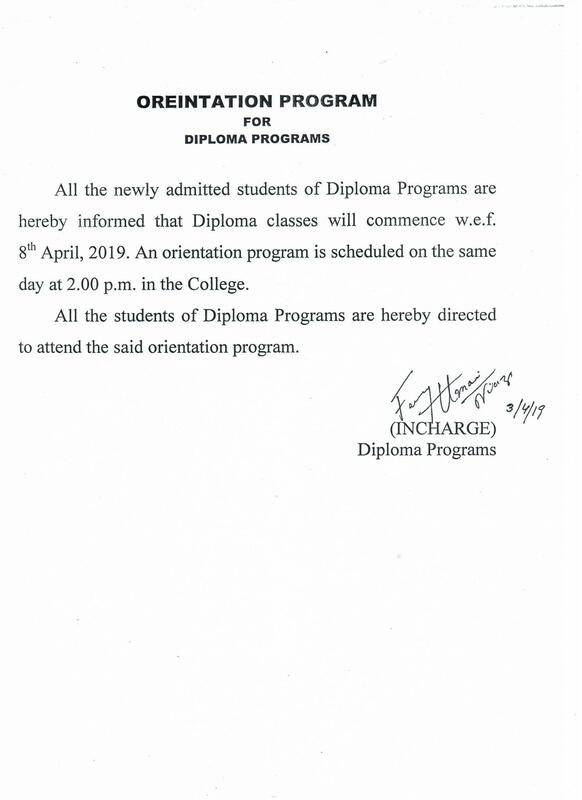 Orientation program for Diploma Program. Notice for Students of LL.M Part-II Session 2017. Result of Entry Test of LL.M Morning/Self Supporting Program (Annual System) held on February 09, 2019. Result of LL.M. Part-I & Part-II, Annual Examination, 2017 (Morning Program). Result of LL.M. Part-I & Part-II, Annual Examination, 2017 (Self Supporting Program). Mr. Abdul Sameed secured Gold Medal in LL.B 3 Year Program (Session 2015-18). The Students of LL.B Part-I who have not registered for HEC-LAT, are hereby directed to contact Principal Office immediately. Team PULC have won the "Best Delegaion Award" hosted by LGS. Mr. Shahid Shaheen & Mr. Asif Ramzan secured Gold Medal in LL.B 3 Year Program (Session 2014-17). Punjab University Law College team won Best Memorial Award in GIKI Moot Competition. TIME TABLE: Ph. D. in Law & Human Rights (2nd Semester). Provisional result of LL.B (Hons.) 10th Semester Session 2013-18. Last two chance to appear in Language Skills VII (Additional Paper) of LL.B. Part-I, 3 Years Program. Time Table LL.M. PART-I & Part-II (Morning & Self-Supporting Program) (Session 2017-2018). Mr. Yousaf Saleem a student of LL.B. (Hons.) 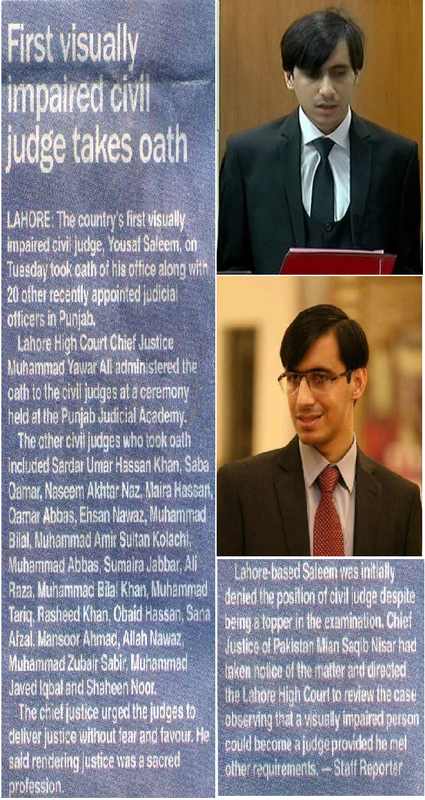 Program, University Law College took oath of First Visually Impaired Civil Judge. Model Papers for LL.B 05 Years Program (Annual System) Part-II. PULC Team won the Asma Jhangir National Law Moot hosted by Quaid-e-Azam University Islamabad. 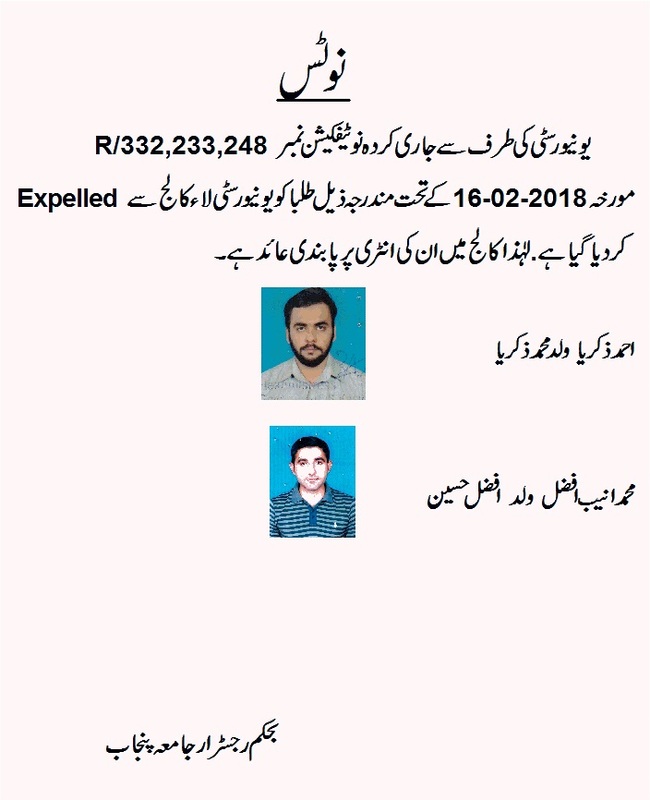 Following students of Law College have been expelled on disciplinary action by Punjab University Administration. PULC organized Mehfil-e- Milad in connection with the holy month of Rabi-ul-Awal. Law College Students secured second position in LGS (Model Town) Debating Championship 2017. Mr. Muhammad Zeeshan Zafar secured first position in B.A/LL.B (Hons.) Program. Model Papers for LL.B 05 Years Program (Annual System). Mr. Asif Ramzan got first position in English Jurisprudence 2nd paper of LL.B. Part-I. Ms. Sana Akhtar has been selected as a young parliamentarian in PILDAT 8th Youth Parliament Pakistan 2016. Law College Students participated in All Punjab Declamation Contest 2016. Law College Students won 1st Parliamentary Debating Championship 2016. PU VC inaugurates Auditorium, Library at Law College. Mr. Khuram Shahzad Bhatti, a student of PULC secure 2nd position in LL.B. Part-III (final examination) throughout the University. Law College Students won 20th All Pakistan GCU Parliamentary Debating Championship. PUMUN Society has won two best delegation awards at International Conferences held in Germany and Spain. Prof. Dr. Shazia Naureen Qureshi has attended her Graduation ceremony at Lancaster University. 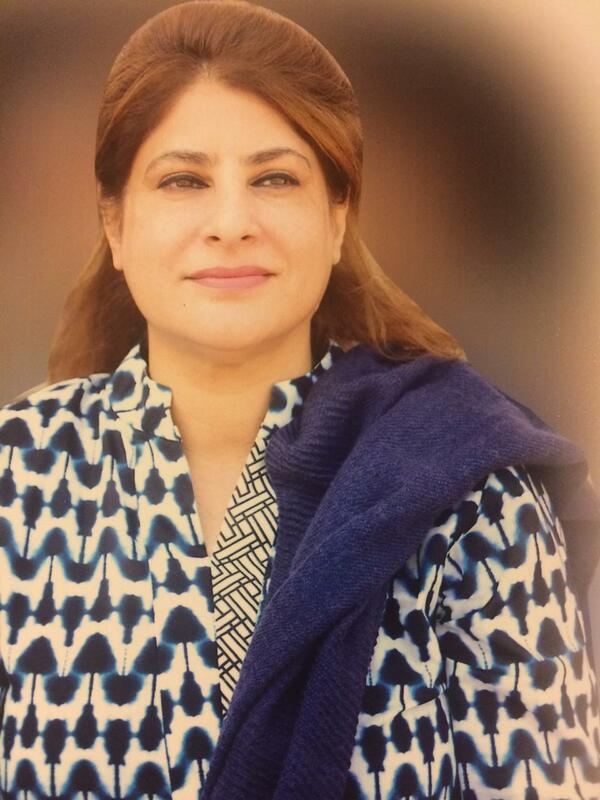 Dr. Shazia Breaks Gender Barrier to Head Punjab University Law College. 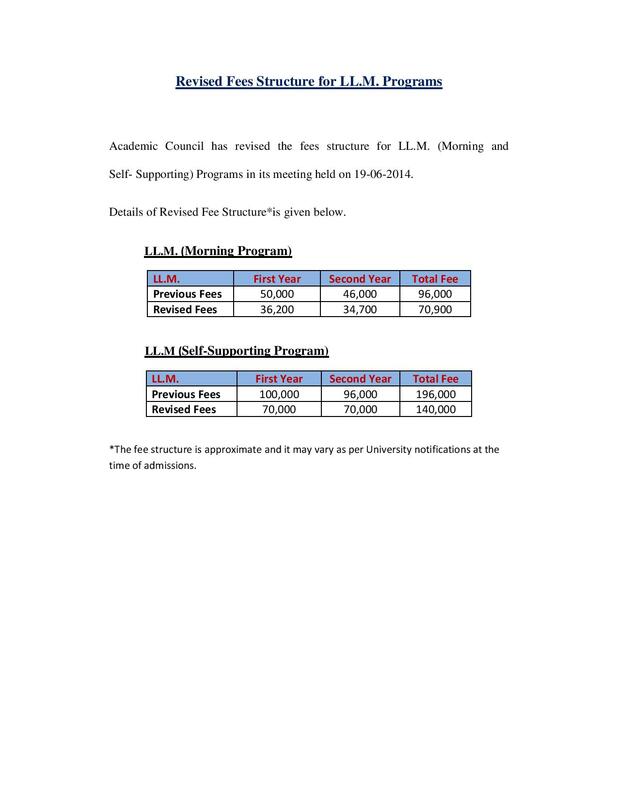 Academic Council reduced the fee structure for L.L.M (Morning and Self Supporting) Programs in its meeting held on 19-06-2014. University Law College, University of the Punjab, is the finest and oldest seat of legal learning in the country. The University Law College is known as the birth place of the finest legal minds in the subcontinent and has been the epitome of judicial heritage in Pakistan since its inception. A number of eminent bureaucrats, politicians, lawyers and judges of higher and superior judiciary are graduates of the college and continue to serve the country to the best of their abilities. Other than training young legal minds, the college focuses on personality development and grooming of students into responsible citizens. Law College was established in 1868, fourteen years before the University of the Punjab and has a rich history and culture. It later became one of the constituent Colleges of the University of the Punjab. Law classes were initiated by Anjuman-i-Punjab in 1868 and were taken over by the College in 1870. Initially, the degree was spanned over two years. In 1873 entry test was introduced for admission purposes in the program and in the same year Chief Court allowed the college to hold pleadership Examination. In 1887, passing of intermediate examination was made a prerequisite for admission in the law program. Later that year, three-fourth attendance was made mandatory for appearing in the examination. In 1890, Government of India empowered the college to confer LL.B. and LL.D. degrees. In order to appear in the LL.B. examination, it was necessary for the aspiring candidates to have graduated in Arts and to have passed the intermediate or the Licentiate in the Law examination. In 1935, College regulations were revised, and the course of instruction for the LL.B. was increased by a year to a span of three years. However, in 1948, regulations were again revised and the course of instruction for the LL.B. degree was reduced once again to two years. In 1964, under the directions of the West Pakistan High Court, the LL.B professional course was extended to three years and in the same year, College started offering two degree courses in Law; B.L. (academic) a degree of two years duration and LL.B. (Legum Baccalaureus) a degree of three years duration. Holders of LL.B. degree were eligible for enrolment as pleaders. In the year 1966 the duration of the LL.B. degree program was converted into two years. However, since 1992-93, three year Bachelor of Law program was re-introduced. The main building of the College in earlier years were hosted at Katchery Road. In 1978, the college was shifted to the present premises at Quaid-e-Azam Campus. It is worth noting here that Prof. Dr. Shazia N. Qureshi, Principal of Law College, is the first woman principal in the long and rich history of the college. Her appointment is ranked important by both male and female staff members for inculcating values of merit, removal of discrimination against women in the college specifically, and society, generally, it also encourages young women to join the profession. The University Law College, being cognizant of the fact that sustainable development in the contemporary world is not possible without proper implementation of law, is committed to impart quality legal education. The University Law College aims at steering University of the Punjab to be a leading public university in providing affordable legal education to develop the culture of thinking, research and advocacy. To be a torchbearer and trendsetter in the field of legal education in the country. To ensure inclusive and equitable quality education and promote life-long learning to attain sustainable development goals in line with Millennium Development Goals (MDG) of the United Nations for the Year 2016-17. To educate and train future lawyers. To Improve the quality and standard of legal education to conform the national and international needs. To develop a culture of legal research and legal reasoning. The PhD program was first offered in the year 1986; however, since then only three students have been awarded PhD degree in law. To Implement the vision of the Principal, Dr. Shazia N. Qureshi, a new PhD program in Law and Human Rights has now again been offered. The University law College has considerably increased the amount of scholarships for the students. Funds have been allocated from college funds to assist students financially. An amount of Rs. 7.7 Million (approx.) has been disbursed amongst merit based and needy students during the academic year 2015-16 and an amount of Rs. 8 million was (approx) was disbursed during academic year 2014-15. The Library has been upgraded and is now more student friendly after introduction of Electro Magnetic system. The Principal, University Law College, acts as Chairperson of Punjab University Model United Nations Society which has won laurels for University while competing at Germany, France, Spain and Turkey. The information provided at the website is issued for the general guidance of students / parents and does not form part of any contract. The PULC intends to provide the services and facilities described herein but reserves the right to withdraw or make alterations if found necessary without any prior notice. The Being a member of a civilized society we are being governed by laws not by men. In this current era of globalization law has become the essence of life. No institution, in the country can be run without proper implementation of law. As far as, University Law College is concerned, it has national and international recognition & is performing a vital role to impart legal knowledge for the sustainable development of legal education and research. Importance of legal education was never at low ebb but now it has attained paramount importance in a globalized society and growing corporate culture. Law certainly sets the legal standards of justice and fairness in the society, therefore, legal education also needs due care and justice with itself. Law College right from its inception is being cognizant of the fact that standard of justice, depends upon the quality of legal education and has never compromised on the standard of legal education. Since 1868 University Law College, has catered for the needs of legal profession by producing eminent lawyers, great jurists and judges. Thevivacious evidence of this fact can be analyzed that most of the alumni of University Law College have been serving in superior judiciary, legislature, bureaucracy, public and private sectors at national and international level. I think it is appropriate to mention that not only the future of this great institution but also beloved country lies in your hands and wisdom. It need not be stated that success of Pakistan will be tested through your abilities and success. After attaining legal education, one must not forget one's duty to those who may not have had access to acquire such knowledge & legal orientation. I am sure that upholding the great traditions of this oldest Law School in the subcontinent you will leave no stone unturned, to up hold the standard of Justice, Fair-play and Equity, in order to alleviate the miseries of down trodden segments of the society. The education that we provide here is an amalgamation of modern trends in education and strong traditions. It would be proved beneficial for the youth of the country to successfully cope with the fast evolving social and economic international environment and get into mainstream. The college provides all that is necessary for its students, enabling them to develop both mentally and physically. The College has best equipped class rooms, computer labs, and a library with more than hunderd thousand books! The college takes pride in having a faculty which is no doubt “Crème de la Crème”, a combination of experienced scholars and talented youth. We have brought the best to teach the best, all under one roof. We believe that in order to facilitate our students their parents should have a role to play. We want to work in collaboration with them as a team so that one day they can be proud of their sons and daughters. In addition to this, our motto, “Progress and Prosperity” coupled with hard work and dedication will help them to excel even further. Many graduates of this college have already distinguished themselves in the academics, research and in the field of law; some are teaching in prestigious colleges and universities or heading organizations at home and abroad. To those of you who will be lucky enough to be finally selected, I offer my heartiest congratulations. I have great faith in the intellectual capabilities of the youth of this country, and pin high hopes on them for a brighter tomorrow. I am sure that after graduating from the University Law College, you too, will distinguish yourself: bringing name and fame to yourself, the college and the nation. 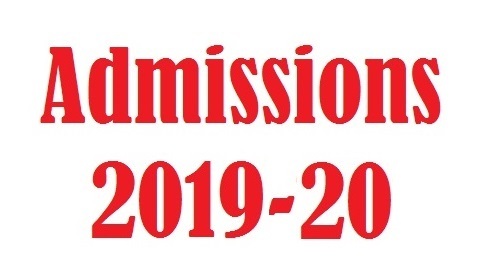 The University Law College is one of the dynamic and progressive constituent colleges of the University of the Punjab dedicated to the promotion of sound and advanced legal studies in the subcontinent. Law is body of principles embodying social values, providing one of the principal instruments of change and a frame work for justice through which changes in society, technology and thinking modify. Thus, law plays an invaluable role in bringing out reforms and stimulating in laying down the standards and norm of behavior morality, justice, socio-cultural norms and business practices. It would be a naive to think that law works in mathematical or mechanical ways. One may agree with justice Oliver Wendell Holmes that, “the life of the law has not been logic: it has been experience… The law embodies the story of a nation’s development through centuries, and it cannot be dealt with as if it contained only the axioms and corollaries of a book of mathematics”. It is pertinent to mention that a large number of alumni, are the prominent member of bar as well as are holding eminent positions in higher judiciary in legal departments of government as well as in multinational law firms throughout the world. University administration, particularly venerable vice chancellor, is highly interested to strengthen the level of advance legal education and research in the law college. My best wishes to the students graduating today and the new comers, for you, a new and bright career is awaiting. The field of law is wide open and it has reached new horizons. If you are fully equipped, talented and prepared to work hard, I am sure, every one of you would shine like a bright star. I encourage you to have faith in your abilities for it is this conviction that helps you face life’s challenges with confidence, grit and determination. Stick to your own conscience and do not stoop down to achieve your meaningful objectives. Keep the flag of the justice, morality, rule of law and legal wisdom high and I wish all success for you in your life.